Carolina Rivera shakes the hand of Maricelis Acevedo, Associate Director for Science for Cornell University’s Delivering Genetic Gain in Wheat Project and WIT mentor, after the announcement of the WIT award winners. As a native of Obregon, Mexico, Carolina Rivera has a unique connection to the heart of Norman Borlaug’s wheat fields. She is now carrying on Borlaug’s legacy and working with wheat as a wheat physiologist at the International Maize and Wheat Improvement Center (CIMMYT) and data coordinator with the International Wheat Yield Partnership (IWYP). Given her talents and passion for wheat research, it is no surprise that Rivera is among this year’s six recipients of the 2019 Jeanie Borlaug Laube Women in Triticum (WIT) Early Career Award. As a young scientist at CIMMYT, she has already worked to identify new traits associated with the optimization of plant morphology aiming to boost grain number and yield. The Jeanie Borlaug Laube WIT Award provides professional development opportunities for women working in wheat. The review panel responsible for the selection of the candidates at the Borlaug Global Rust Initiative (BGRI), was impressed by her commitment towards wheat research on an international level and her potential to mentor future women scientists. Established in 2010, the award is named after Jeanie Borlaug Laube, wheat science advocate and mentor, and daughter of Nobel Laureate Dr. Norman E. Borlaug. 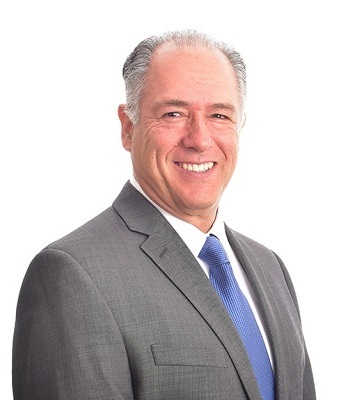 As a winner, Rivera is invited to attend a training course at CIMMYT in Obregon, Mexico, in spring 2020 as well as the BGRI 2020 Technical Workshop, to be held in the UK in June 2020. Since the award’s founding, there are now 50 WIT award winners. 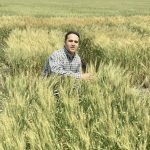 The 2019 winners were announced on March 20 during CIMMYT’s Global Wheat Program Visitors’ Week in Obregon. 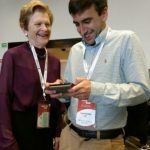 In the following interview, Rivera shares her thoughts about the relevance of the award and her career as a woman in wheat science. Q: What does receiving the Jeanie Borlaug Laube WIT Award mean to you? I feel very honored that I was considered for the WIT award, especially after having read the inspiring biographies of former WIT awardees. Receiving this award has encouraged me even more to continue doing what I love while standing strong as a woman in science. It will is a great honor to receive the award named for Jeanie Borlaug, who is a very active advocate for wheat research. I am also very excited to attend the BGRI Technical Workshop next year, where lead breeders and scientists will update the global wheat community on wheat rust research. I expect to see a good amount of women at the meeting! Q: When did you first become interested in agriculture? 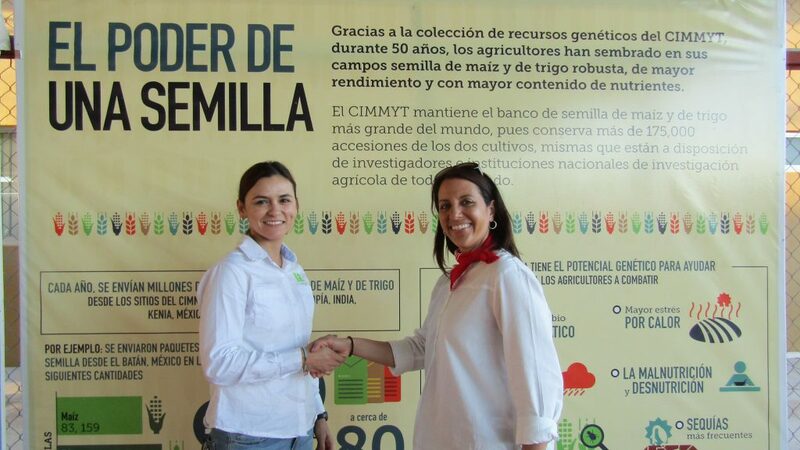 My first real encounter with agriculture was in 2009 when I joined CIMMYT Obregon as an undergraduate student intern. I am originally from Obregon, so I remember knowing about the presence of CIMMYT, Campo Experimental Norman E. Borlaug (CENEB) and Instituto Nacional de Investigación Forestales Agrícolas y Pecuario (Inifap) in my city but not really understanding the real importance and impact of the research coming from those institutions. After a few months working at CIMMYT, I became very engrossed in my work and visualized myself as a wheat scientist. Q: Why is it important to you that there is a strong community of women in agriculture? We know women play a very important role in agriculture in rural communities, but in most cases they do not get the same rights and recognition as men. Therefore, policies — such as land rights — need to be changed and both women and men need to be educated in gender equity. I think the latter factor is more likely to strengthen communities of women, both new and existing, working in agriculture. In addition, women should participate more in science to show that agricultural research is an area where various ideas and perspectives are necessary. To achieve this in the long run, policies need to look at current social and cultural practices holding back the advancement of women in their careers. Q: What are you currently working on with CIMMYT and IWYP? 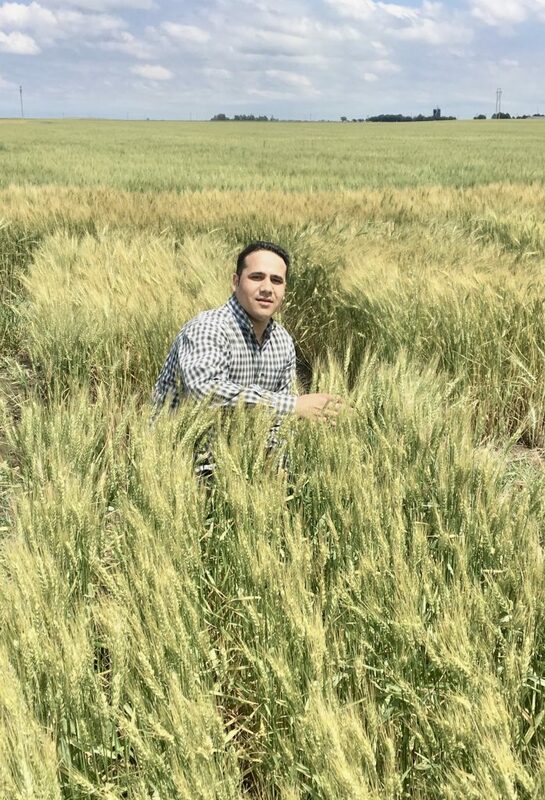 I am a post-doctoral fellow in CIMMYT’s Global Wheat Program where I assist in collaborative projects to improve wheat yield potential funded by IWYP. I am also leading the implementation of IWYP’s international research database, helping to develop CIMMYT’s wheat databases in collaboration with the center’s Genetic Resources Program. Apart from research and data management, I am passionate about offering trainings to students and visitors on field phenotyping approaches. Q: Where do you see yourself in the agriculture world in 10 years? In 10 years, I see myself as an independent scientist, generating ideas that contribute to delivering wheat varieties with higher yield potential and better tolerance to heat and drought stresses. I also see myself establishing strategies to streamline capacity building for graduate students in Mexico. At that point, I would also like to be contributing to policy changes in education and funding for science in Mexico. To build resilience against the threat of wheat blast, training sessions were held in Bangladesh to increase the reach of research findings and possible solutions as well as to educate the stakeholders involved. Since 2017, hands-on training on disease screening and surveillance of wheat blast have been organized every year in Bangladesh, with participation of national and international scientists. The third of its kind was jointly organized by the International Maize and Wheat Improvement Center (CIMMYT), Wheat and Maize Research Institute (BWMRI), and the Department of Agricultural Extension (DAE) Bangladesh during 19-28 February, 2019 at Regional Agricultural Research Station, Jashore with financial support from the Australian Centre for International Agricultural Research (ACIAR), the CGIAR Research Program on Wheat (WHEAT), the Indian Council of Agricultural Research (ICAR), the Krishi Gobeshona Foundation (KGF) and the U.S. Agency for International Development (USAID). The objective of the training was to learn the basic techniques of pathogen identification and its culturing, field inoculation and disease scoring and share experiences regarding combating the disease and its progress among the participants from home and abroad. Thirty five wheat scientists from China, India and Nepal as well as from BWMRI, DAE and CIMMYT in Bangladesh participated in the training. The training was inaugurated by Kamala Ranjan Das, Additional Secretary (Research), Ministry of Agriculture, Bangladesh. The Director General of BWMRI, Dr. Naresh C. D. Barma was the Chair and Dr. T. P. Tiwari, Country Representative, CIMMYT Bangladesh and Additional Director of Jashore region of DAE were the special guests in the inaugural session. In addition to Bangladeshi experts, Dr. José Maurício C. Fernandes from Brazil, Dr. Pawan K. Singh from CIMMYT, Mexico and Dr. Timothy J. Krupnik from CIMMYT, Bangladesh presented the updates on the techniques for mitigating the disease. Dr. M. Akhteruzzaman, Deputy Director of DAE, Meherpur, who has been working very closely with wheat blast research and extension, spoke on the history and present status of wheat blast in Bangladesh. It was a unique opportunity for the trainees to listen from grass root level experience based on the real situation in the farmers’ fields. Group photo of trainees at the precision phenotypic platform (PPP) for wheat blast at Regional Agricultural Research Station, Jashore, Bangladesh. Wheat is especially susceptible to blast infection during warm and humid weather conditions. While the fungus infects all above ground parts of the crop, infection in spikes is most critical and responsible for yield loss. 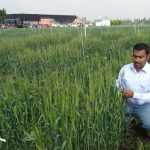 Hence, to determine whether blast is endemic to the specific region and also to assess the epidemic potential in unaffected regions, Dr. Fernandes developed a wheat blast forecasting model with support from CIMMYT Bangladesh. 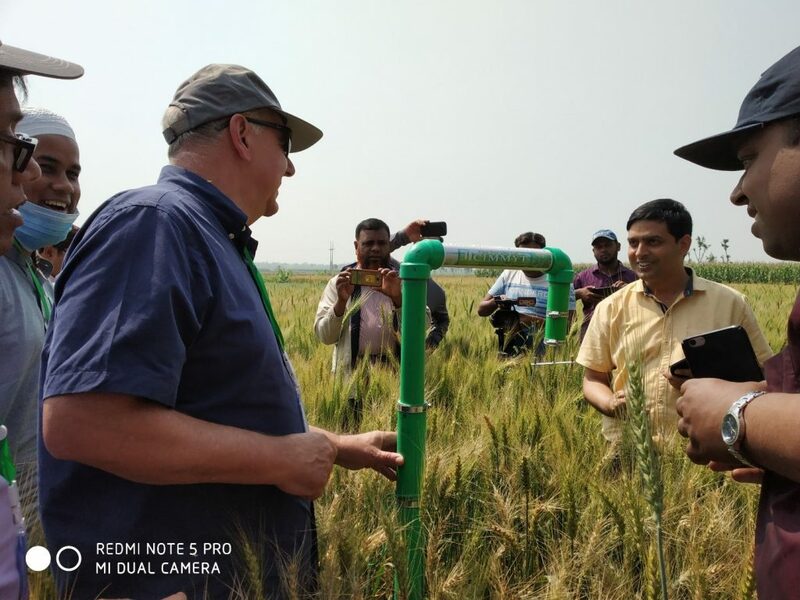 To collect data on the presence of wheat blast spores in the air, CIMMYT, in collaboration with BWMRI, installed four spore traps in four different wheat fields in Meherpur, Faridpur, Rajshahi and Dinajpur districts of Bangladesh. The results from these spore traps and weather parameters will help validate the wheat blast forecasting model. After final validation, the recommendation message will be sent to farmers and DAE personnel through mobile app. 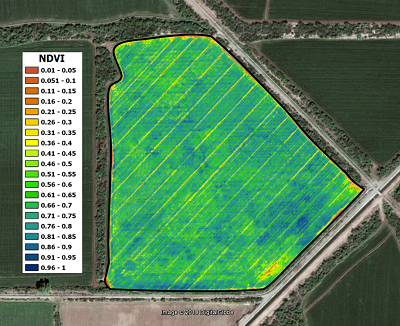 This will help farmers decide the perfect time for spraying fungicide to control blast effectively. During the training participants received the hands-on experience of activities in the precision phenotypic platform (PPP) for wheat blast, where 4500 germplasm from different countries of the world and CIMMYT Mexico are being tested under artificial inoculated conditions. To keep the environment sufficiently humid, the trial is kept under mist irrigation to facilitate proper disease development. 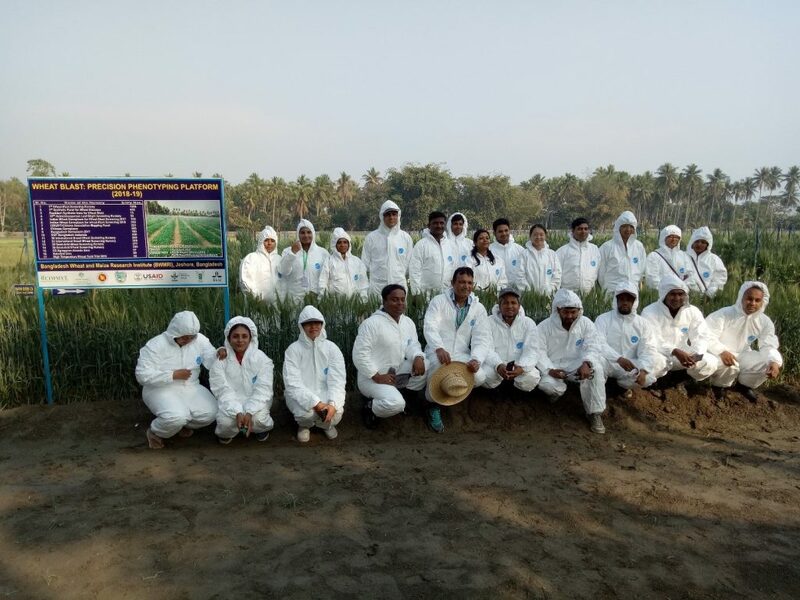 Trainees learned identification of leaf and spike symptoms of wheat blast, identification and isolation of conidia under microscope, inoculum preparation, tagging selected plants in the fields for inoculation, field inoculation of germplasms being tested at the PPP and more. According to the United States Department of Agriculture (USDA), wheat consumption in Bangladesh is 7.7 million tons as of 2018 while only 1.25 million tons are supplied domestically. Since the majority of wheat is imported, it will adversely affect the economy if the comparatively smaller amount the country produces decreases due to blast. 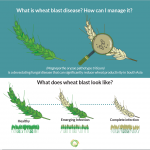 So the impact of wheat blast is not limited to food production but affects the economy as a whole, and steps to help mitigate the disease are crucial in ensuring healthy growth of wheat yield. Wheat blast, caused by Magnaporthe oryzae pathotype Triticum (MoT), was first discovered in Brazil in 1985 and then surprisingly appeared in the wheat fields of Bangladesh in 2016, causing 25-30% yield loss in 15,000 ha. As an immediate response to this crisis, CIMMYT and the government of Bangladesh have worked together to mitigate the disease, most notably by distributing factsheets to farmers, conducting routine follow-ups followed by the development and rapid release of blast resistant wheat variety BARI Gom 33 and tolerant varieties (BARI Gom 30 and 32) and strengthening research on blast. Seventy-five years ago, the seeds of the Green Revolution were planted when Norman Borlaug began his work on wheat breeding in Mexico. 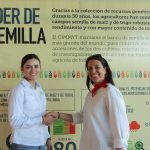 The success of that effort, which was a partnership between the Mexican government and the Rockefeller Foundation, led to the eventual founding of the International Maize and Wheat Improvement Center (CIMMYT). In 1971, CGIAR was established as an umbrella organization to create an international consortium of research centers. CIMMYT was one of the first research centers supported through the CGIAR, which today includes 15 centers around the world with a local presence in 70 countries. Each center focuses on unique challenges, but they are all driven by three broad strategic goals: to reduce poverty; to improve food and nutrition security; and to improve natural resources and ecosystem services. For 50 years, wheat has been one of the core crops of CGIAR’s focus. CGIAR receives annual funding of about $30 million for wheat, and the economic benefits of that wheat breeding research range from $2.2 to $3.1 billion. This is a benefit-cost ratio of at least 73 to 1 — for every $1 spent in CGIAR wheat research funding, there is more than $73 in economic benefits to global wheat farmers. CIMMYT’s international wheat improvement programs generate $500 million per year in economic benefits. Globally, nearly half of the wheat varieties planted are CGIAR-related; in South, Central and West Asia and North Africa, that number rises to 70 to 80 percent of wheat varieties. When wheat supplies 20 percent of protein and calories in diets worldwide, CGIAR wheat research can have a major impact on the livelihoods of the world’s most poor people. CGIAR Research Centers have also led to significant benefits for U.S. farmers as well. Approximately 60 percent of the wheat acreage planted in the U.S. uses CGIAR-related wheat varieties. CIMMYT wheat improvement spillovers in the United States repay the total U.S. contribution to CIMMYT’s wheat improvement research budget by a rate of up to 40 to 1. 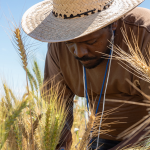 Another partner, the International Center for Agricultural Research in the Dry Areas (ICARDA), has delivered innovations that protect U.S. farmers from crop losses due to destructive pests, and has also partnered with CIMMYT to develop the One Global Wheat Program under CGIAR. One aspect of the CGIAR success story in the United States is about partnership. 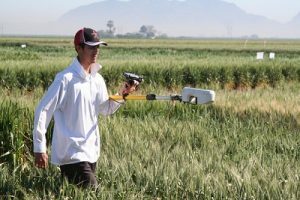 Public U.S. universities around the country have partnered with CGIAR on agricultural research, to the benefit of U.S. farmers and farmers worldwide. This partnership allows for knowledge transfer and idea-sharing on a global scale. USW is proud that many of our member states have universities that have partnered with CGIAR on wheat projects. The news is not all good, however. As we anticipate world population growing to 10 billion in 2050, the demand for wheat is expected to increase by 50 percent. To meet that demand, wheat yields must increase by 1.6 percent annually. Currently they are increasing by less than 1 percent annually. There is plenty of work to do to continue Borlaug’s mission of achieving food security. CGIAR Research Centers will continue to play a critical role in that effort. The United States’ investment in CGIAR Research Programs makes a vital contribution to agricultural improvements and fosters partnerships with U.S. public research universities, international research centers, private sector partnerships and others. 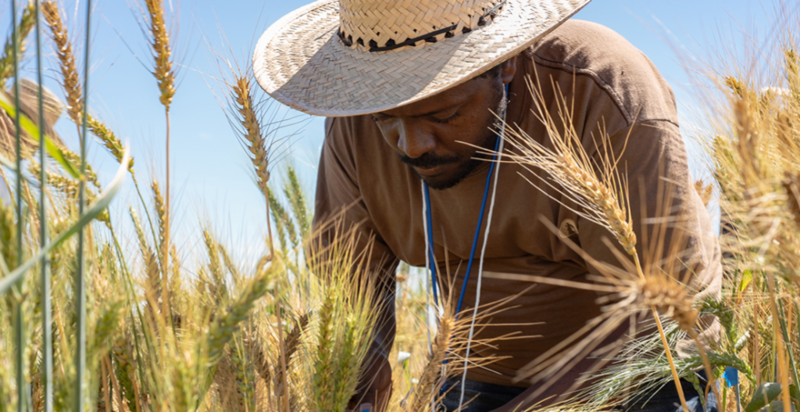 Partnerships with CGIAR make it possible to do the win-win collaborative wheat research that helps meet global food needs, brings tremendous economic benefits to U.S. agriculture and leverages U.S. research dollars. We invite our stakeholders and overseas customers to learn more about this important partnership and the benefits of CGIAR wheat research in part through a fact sheet posted here on the USW website. 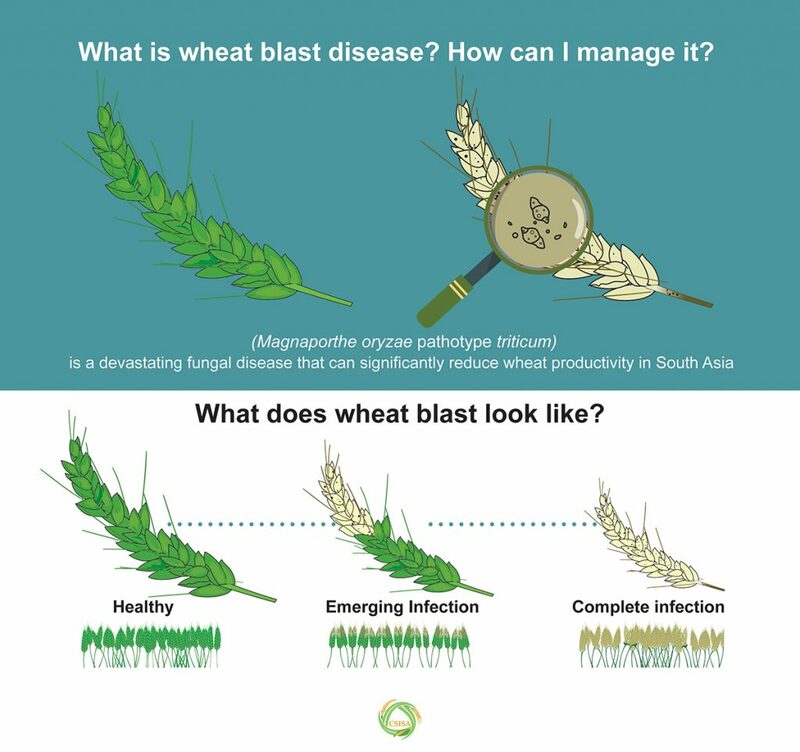 Wheat blast is a fast-acting and devastating fungal disease that threatens food safety and security in the Americas and South Asia. First officially identified in Brazil in 1984, the disease is widespread in South American wheat fields, affecting as much as 3 million hectares in the early 1990s. In 2016, it crossed the Atlantic Ocean, and Bangladesh suffered a severe outbreak. 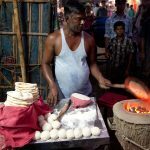 Bangladesh released a blast-resistant wheat variety—developed with breeding lines from the International Maize and Wheat Improvement Center (CIMMYT)—in 2017, but the country and region remain extremely vulnerable. The continued spread of blast in South Asia—where more than 100 million tons of wheat are consumed each year—could be devastating. Researchers with the CIMMYT-led and USAID-supported Cereal Systems Initiative for South Asia (CSISA) and Climate Services for Resilient Development (CSRD) projects partner with national researchers and meteorological agencies on ways to work towards solutions to mitigate the threat of wheat blast and increase the resilience of smallholder farmers in the region. These include agronomic methods and early warning systems so farmers can prepare for and reduce the impact of wheat blast. 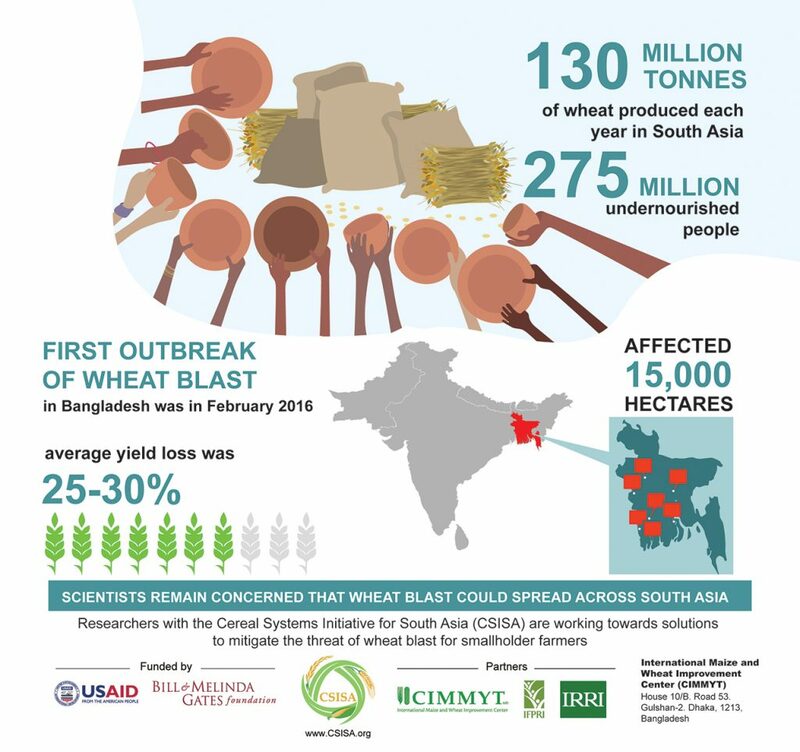 This series of infographics shows how wheat blast spreads, its potential effect on wheat production in South Asia and ways farmers can manage it. This work is funded by the U.S. Agency for International Development (USAID) and the Bill & Melinda Gates Foundation). CSISA partners include CIMMYT, the International Food Policy Research Institute (IFPRI), and the International Rice Research Institute (IRRI). CIMMYT and its partners work to mitigate wheat blast through projects supported by U.S. Agency for International Development (USAID), the Bill and Melinda Gates Foundation, the Australian Centre for International Agricultural Research (ACIAR), Indian Council for Agricultural Research (ICAR), CGIAR Research Program on WHEAT, and the CGIAR Platform for Big Data in Agriculture. A recent study by India and US scientists shows that when vulnerable young children in India consume foods with wheat-enriched zinc, the number of days they spend sick with pneumonia and vomiting significantly diminishes. 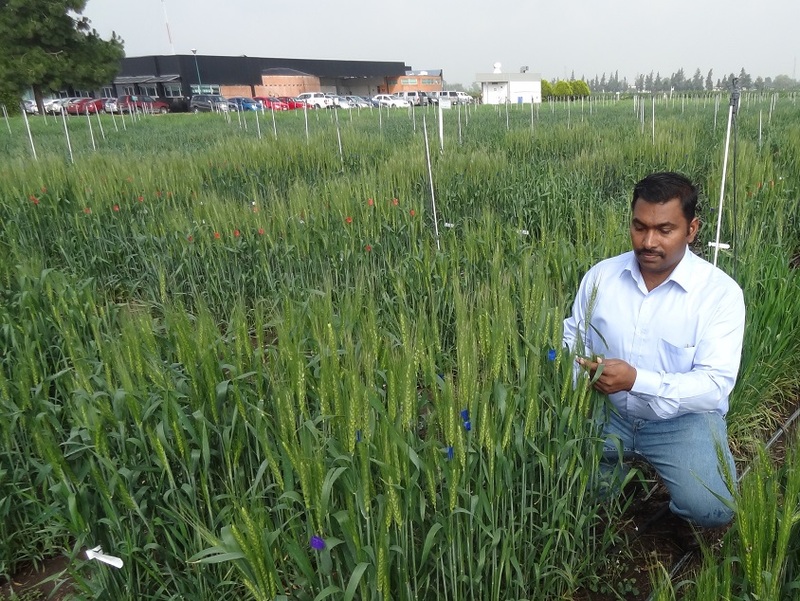 Velu Govindan (CIMMYT) inspects zinc-fortified wheat. Photo: CIMMYT files. 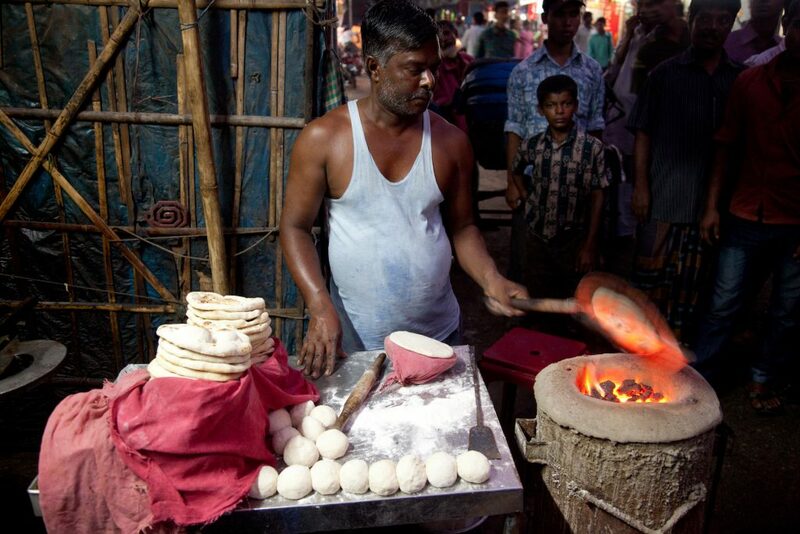 An estimated 26 percent of India’s population lacks adequate micronutrients in their diets. Developed through biofortification — the breeding of crop varieties whose grain features higher levels of micronutrients — high-zinc wheat can help address micronutrient deficiencies. The results of the study, which took place over six months, confirm zinc-enhanced wheat’s potential to improve the diets and health of disadvantaged groups who consume wheat-based foods, but the authors conclude that longer-term studies are needed. 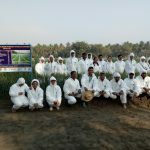 In partnership with HarvestPlus and partners in South Asia, the International Maize and Wheat Improvement Center (CIMMYT) has bred and fostered the release in the region of six zinc-enhanced varieties that are spreading among farmers and seed producers. Zero till wheat planting in Jaffarabad District. More than 70 agricultural professionals met in Islamabad, Pakistan, during September 4-5 to discuss agronomy and wheat activities under the Agricultural Innovation Program (AIP) for Pakistan. The event provided a platform for institutions involved in agronomy and the dissemination of agricultural technology and seed to share advances, discuss issues, and plan future undertakings. “Crop productivity must be increased through research on innovative crop management techniques, varietal development and dissemination of better techniques and seed to farming communities,” said Dr. Yusuf Zafar, Chairman of PARC, addressing participants and touching upon a key theme of the event. He emphasized that precision agriculture, decision support systems, the use of drones, water productivity improvements and more widespread mechanization were on the horizon for Pakistani farmers, but that this would require active involvement of the public and private sectors. Developments in zero tillage farming and ridge planting were highlighted in the two-day conference as conservation agriculture practices that are gaining traction in national wheat farming, according to Imtiaz Muhammad, CIMMYT representative and AIP project leader. Collaboration with agricultural machinery manufacturers and other private sector actors is leading to local production of Zero Till Happy Seeders, which sow directly into unplowed fields and the residues of previous crops, according to Imtiaz. “Innovative approaches have also resulted in the production of 1,500 tons of wheat seed in 2018,” he explained. 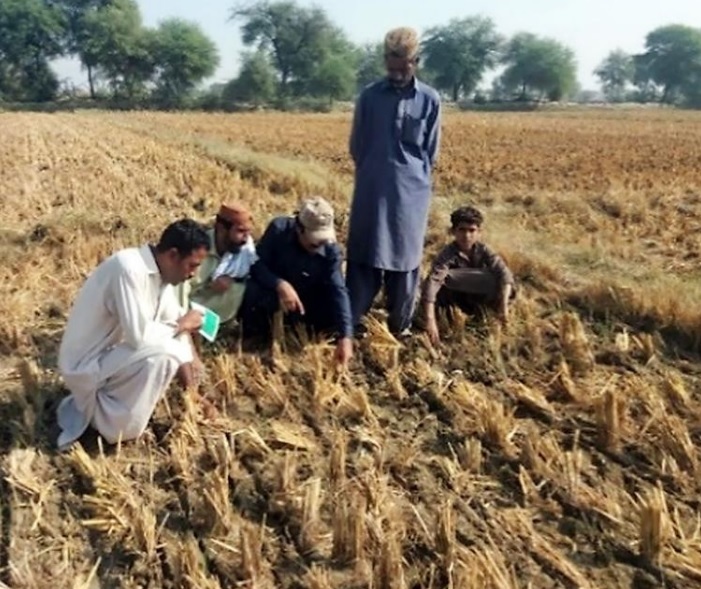 Wheat seed production and farmers’ replacement of older varieties have progressed through local seed banks established by AIP in partnership with Pakistan’s National Rural Support Program (NRSP). Located in villages, the banks sell quality wheat seed for up to 12 percent less than local markets. 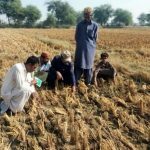 “This is critical, because Pakistan’s wheat seed replacement is only 30 percent,” said Imtiaz, adding that there is a 50 percent gap between potential wheat yields and the national average yield for this crop. The AIP will open more seed banks in remote areas of Pakistan, in conjunction with national partners. As well as producing and processing seed, the banks will provide farm machinery contract services and precision agriculture tools at subsidized rates. Participants’ recommendations included adding straw spreaders to combine harvesters for rice, to facilitate the direct sowing of wheat after rice. They also suggested that agricultural service providers should help promote the direct seeding of rice and wheat with zero tillage implements. Participants observed that, in Baluchistan Province, support to farmers and service providers could increase the adoption of zero tillage for sowing wheat after rice and of precision land leveling, to improve irrigation efficiency and save water. The AIP and partners will continue to promote water saving and nutrient management techniques, as well as building the capacity of farmers, national staff and agricultural service providers. Finally, those attending recommended that, for its second phase, AIP focus on the biofortification of wheat and rice, climate smart agriculture, decision support tools, women in farming, knowledge delivery, appropriate mechanization, nutrient management, weed management and water productivity. AIP is the result of the combined efforts of the Pakistan Agriculture Research Council (PARC), the International Livestock Research Institute (ILRI), the International Center for Agricultural Research in the Dry Areas (ICARDA), the International Rice Research Institute (IRRI), the World Vegetable Center (AVRDC), the University of California at Davis, and the International Maize and Wheat Improvement Center (CIMMYT). It is funded by the United States Agency for International Development (USAID). With these national and international partners on board, AIP continues to improve Pakistan’s agricultural productivity and economy. 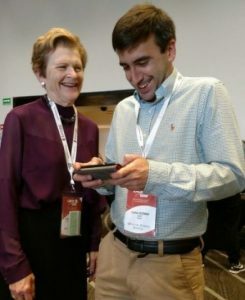 MEXICO CITY (CIMMYT) — Malnutrition is rising again and becoming more complex, according to the director-general of the world’s leading public maize and wheat research center. 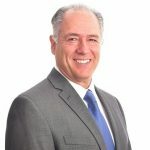 “After declining for nearly a decade to around 770 million, the number of hungry people has increased in the last two years to more than 850 million,” said Martin Kropff, director general of the International Maize and Wheat Improvement Center (CIMMYT), in the opening address of the 4th Latin American Cereals Conference. Held in Mexico City during 11-14 March and co-organized by CIMMYT and the International Association for Cereal Science and Technology (ICC), the 4th Latin American Cereals Conference has drawn more than 220 participants from 46 countries, including professionals in agricultural science and production, the food industry, regulatory agencies, and trade associations. Köksel added that ICC has more than 10,000 subscribers in 85 countries. One way to improve the nutrition and health of the poor who cannot afford dietary supplements or diverse foods is through “biofortification” of the staple crops that comprise much of their diets. Drawing upon landraces and diverse other sources in maize and wheat’s genetic pools and applying innovative breeding, CIMMYT has developed high-yielding maize and wheat lines and varieties that feature enhanced levels of grain zinc and are being used in breeding programs worldwide. CIMMYT is focusing on enhancing the levels of provitamin A and zinc in the maize germplasm adapted to sub-Saharan Africa, Asia, and Latin America. Improved quality protein maize (QPM) varieties, whose grain features enhanced levels of two essential amino acids, lysine and tryptophan, is another major biofortified maize that is grown worldwide, according to Prasanna Boddupalli, director of CIMMYT’s global maize program. “Quality protein maize varieties are grown by farmers on 1.2 million hectares in Africa, Asia, and Latin America,” said Prasanna, in his presentation, adding that provitamin-A-enriched maize varieties have also been released in several countries in Africa, besides Asia. A major partner in these efforts is HarvestPlus, part of the CGIAR Research Program on Agriculture for Nutrition and Health (A4NH), which supports the development and promotion of the biofortified crop varieties and related research. A central issue on the conference agenda is promoting awareness about the importance of healthy diets and the role of whole grains. Guzmán also thanked the conference sponsors: Bimbo, Bastak Instruments, Brabender, Foss, Chopin Technologies, Perten, Stable Micro Systems Scientific Instruments, Cereal Partners Worldwide Nestlé and General Mills, Stern Ingredients-Mexico, World Grain, the CGIAR Research Program on Wheat, and Megazyme.